Geoff Latter is a Warbird and Aerobatic Pilot, an Airline Pilot, and an Unrestricted Surface Rated Air Show Performer. Born in Hamilton, Ontario, Canada, and growing up in the Nation's Capital, Geoff flew his first airplane at the age of 12. Although he took his first flight up into the skies that day, he never really came back down. Geoff has been flying professionally since 1998, and has experience in a wide variety of aircraft ranging from high performance aerobats to modern jet airliners to iconic WWII fighters. Growing up with the stories of the airmen of WWII from his grandfather, Geoff's true passion in aviation has always been warbirds, and he has had the privilege of flying them since 2003. After 14 years of saving, training, and preparation, Geoff finally realized his dream of operating his own warbird in the fall of 2012 with the acquisition of Nancy, the Nanchang CJ-6A. 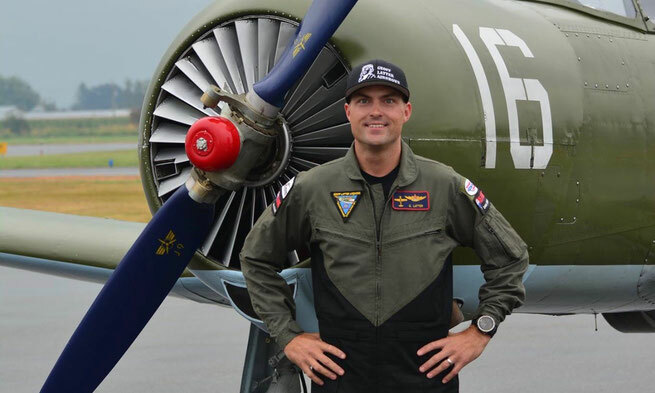 Whether he is preserving the memories from that generation, or the aircraft from that time period, it is clear that he has found his calling by interacting with the public at air shows and aviation related events across North America.